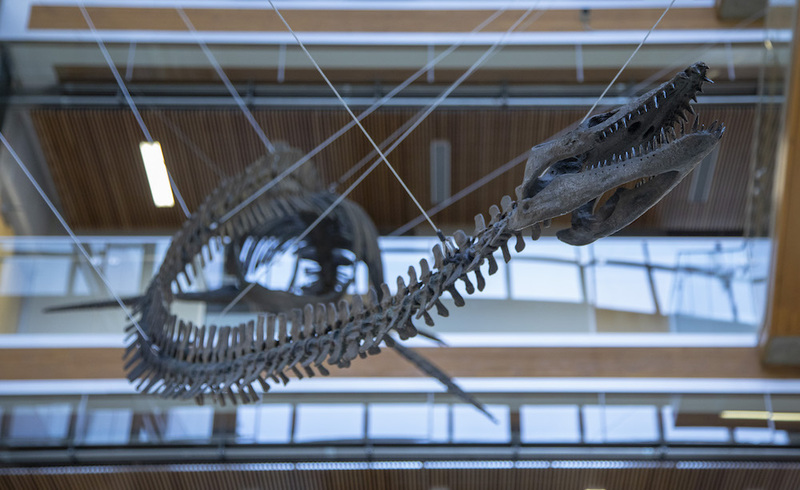 The University of British Columbia have erected a spectacular 13-metre-long Elasmosaurus skeleton in their Pacific Museum of Earth. 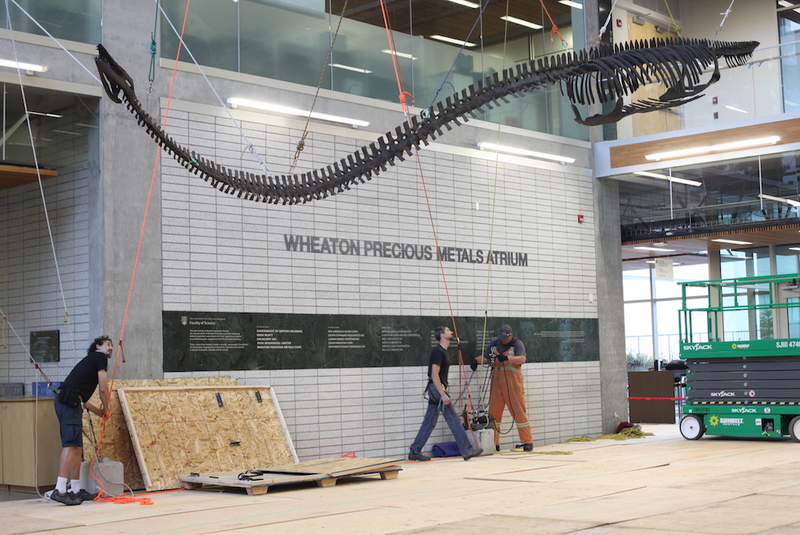 The resin reconstruction was suspended in the Wheaton Precious Metals Atrium of the University’s Earth Sciences Building earlier this month (15th-16th September 2018). 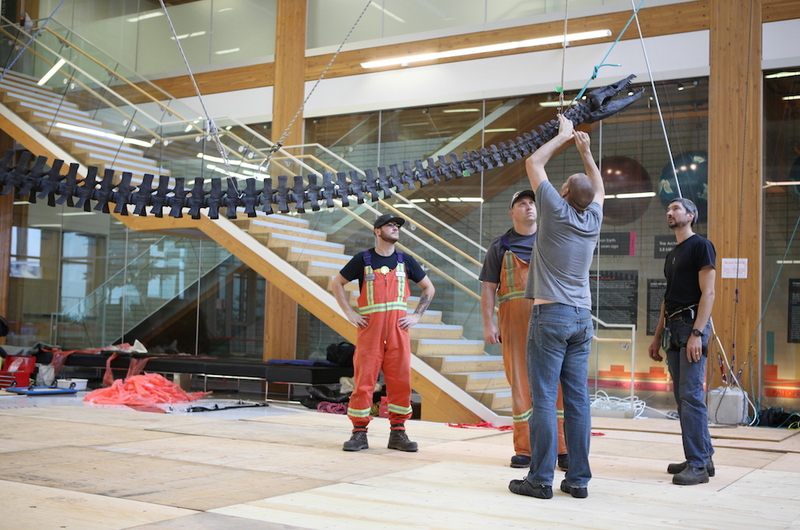 Installation of the skeleton was led by Mike deRoos of Cetacea Contracting, a Salt Spring Island company that specialises in the design and articulation of marine and terrestrial skeletons. The skeleton itself was created by Triebold Paleontology Inc. and casts are available here. The skeleton is mounted in a graceful diving pose. Photo by UBC. I wonder, if an Elasmosaurus wanted to keep its neck warm, would it prefer a very long scarf or a snood? Photo by UBC. Elasmosaurus, the eponymous elasmosaurid, was the first of its kind to be named (in 1868) and held the record for the animal with greatest number of neck vertebrae for nearly 150 years, until Albertonectes came along and dethroned her in 2012. Only one specimen of Elasmosaurus platyurus has ever been described. It was studied by Edward Cope who famously recalled preprints of his paper after he erroneously and inexplicably placed the head on the end of the tail. Even back then plesiosaurs were well known to have long necks, so how he made this mistake remains a bit of a mystery. Awaiting the flippers and being winched up. Photo by UBC. When Cope described the fossil material it consisted of a partial skeleton including an almost complete vertebral column and girdles, but only fragments of the skull and no limbs. However, the girdles were later lost and were probably destroyed. 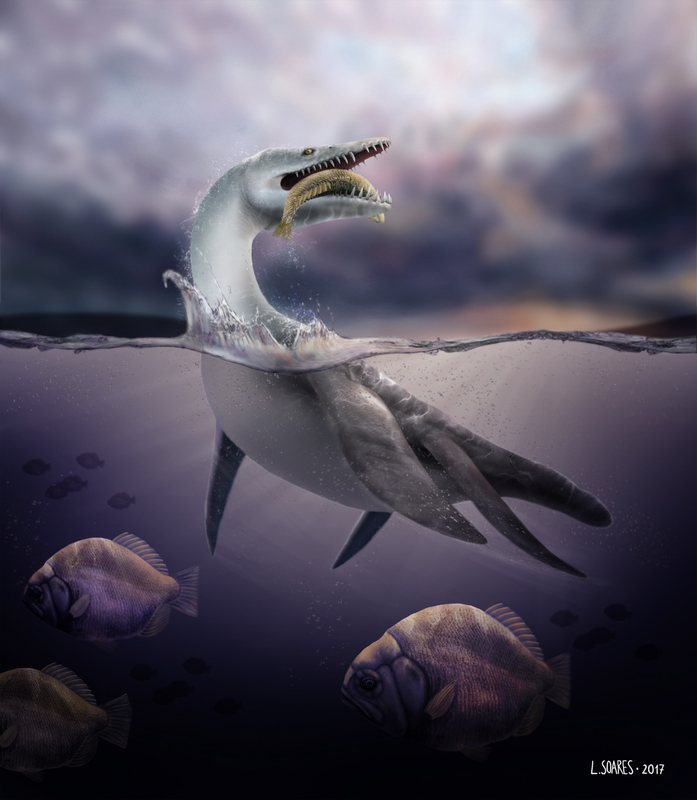 Given the incompleteness of the holotype specimen and paucity of true Elasmosaurus material in general, the Triebold specimen of Elasmosaurus is inevitably mostly reconstructed, presumably based mainly on closely related and better known elasmosaurids. Copies of the ‘Triebold Elasmosaurus‘ can be seen in several other museums, but this story has prompted me to do a little bit of digging, with the help of Sven Sachs, to see if we can find out more about the origins of this wonderful model. 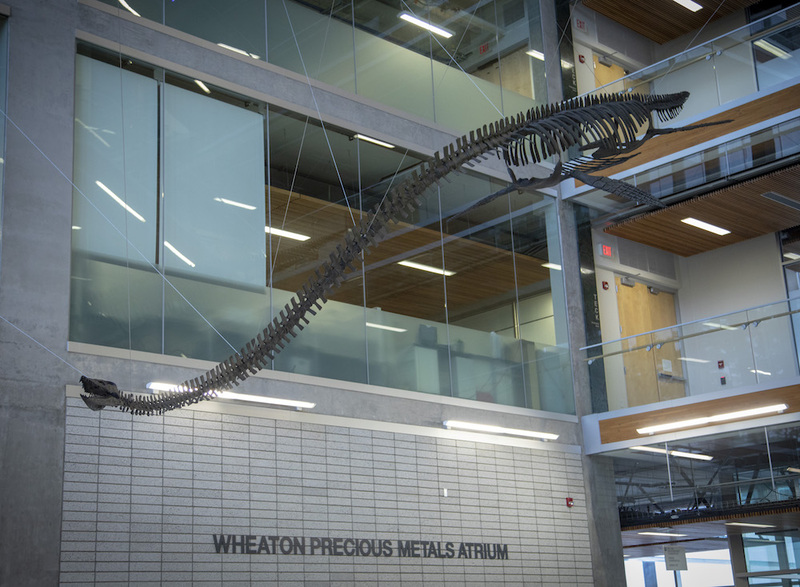 A prey’s-eye-view of the completed UBC Elasmosaurus reconstruction. Photo by UBC. What a great model. 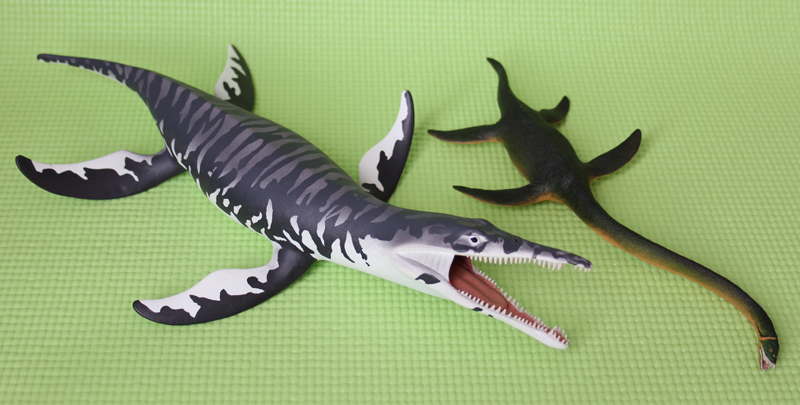 It is made with a real understanding of plesiosaur anatomy.